Most of us feel the negative effects of sleep deprivation almost every day at work, and while we all try to combat them by drinking who knows how many cups of coffee until the end of our working time, recently, experts recommend taking a short nap as the best way to energize and get back to work. Sara C. Mednick, Ph.D., sleep expert and author of Take a Nap! Change Your Life aims that taking a nap for about 20 minutes will help you reset the system and boost your alertness and motor performance. Sleep deprivation is a serious issue that can interfere with your mood, reaction time, mental clarity, stress levels, blood pressure, memory, and metabolism. Some American workplaces have understood the power of short napping and encourage their employees to recharge their brains with a nap, such as NASA, Huffington Post, Mercedez-Benz Financial Services, White & Case, and many other brands. Google employees are encouraged to take power naps at work, while David Radcliffe—Vice President, Real Estate and Workplace Services, claims that workplaces are incomplete without a nap pod. 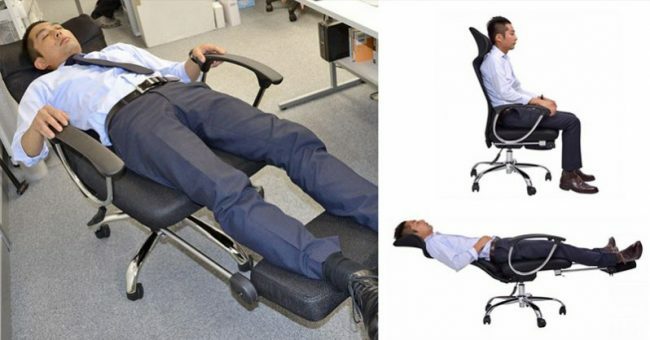 Moreover, the invention by the Japanese retailer Thanko known as the “Lay Flat Office Chair”, which looks like a standard wheeled office chair, actually converts into a completely perpendicular office bed, which can virtually change your napping experience at work! It is sold for ¥49,800 (approximately $600), and the lay flat office chair is shipped unassembled. It weighs 48.5 lbs and measures 25.2 inches wide x 51.2 inches tall x 68.9 inches deep when fully put together. Yet, note that you will need to venture through a Japanese website to purchase it, so it would be of great help if you have a Japanese speaking friend to help you with the purchase. You also have another option to get such a chair, since there are similar models available on Amazon, such as XUERUI 360 Degree Swivel Chair which reclines to about 145 degrees, whose price starts from $600, and you can find it on Amazon and Happybuy Executive Swivel Office Chair, from $115 which can be also found on Amazon.